Space shuttle Atlantis, as seen leaving NASA's Vehicle Assembly Building for the final time. See collectSPACE.com for more photos. Space shuttle Atlantis has left the building — NASA's voluminous Vehicle Assembly Building (VAB) at the Kennedy Space Center in Florida — for the final time. 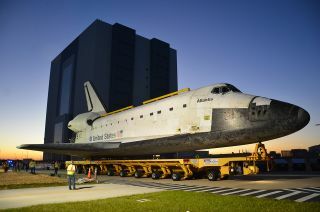 The last of the space agency's retired space shuttles to be museum-bound, Atlantis was rolled out of the 52-story VAB early Friday morning (Nov. 2) to leave on a day-long move to the Kennedy Space Center Visitor Complex, 9.8 miles (15.8 kilometers) away. There, the orbiter will enter a new $100 million display facility, still under construction, which is set to open to the public in July 2013. Atlantis, which began its journey with its first motion at 6:30 a.m. EDT (1030 GMT), is expected to arrive at the visitor complex and the entrance to its yet-be-named exhibition building 12 hours later. Rather than rolling on its landing gear, Atlantis is riding on top of NASA's 76-wheel Orbiter Transporter System (OTS), which travels at a top speed of 2 miles per hour. Hundreds of the former space shuttle program's workers and thousands of ticketed spectators were expected to turn out to witness Atlantis' final move as it slowly rolls to its new home. Its less-than-direct, roundabout route, more than two-thirds of it on government property, was chosen to avoid large obstacles along the road, including security gates keeping the public out. Space shuttle Atlantis, as seen inside NASA's Vehicle Assembly Building for the final time, Nov. 1, 2012. See collectSPACE.com for more photos. Atlantis is, however, scheduled to stop for three hours at a commercial industry park just outside the space center's boundaries, to give up to 4,000 bused-in spectators their chance to see the shuttle. And the public who have paid for the privilege will be able to watch as Atlantis arrives at the visitor complex this evening, as a parade of more than 30 astronauts and a fireworks display usher the orbiter into its building. Before then, a farewell ceremony for former space shuttle workers and NASA employees is planned for mid-morning as Atlantis arrives at Kennedy's Headquarters building. NASA Administrator Charles Bolden and center director Bob Cabana are scheduled to deliver remarks, as are the four astronauts who flew on STS-135, Atlantis' final flight, in 2011, and Bill Moore, chief operating officer for the visitor complex at Delaware North, a contractor that manages the visitor center. Atlantis is the fourth and final orbiter to be delivered to its display home since the shuttle program ended and NASA awarded the vehicles to museums last year. Fleet leader Discovery arrived and opened immediately on display in April at the Steven F. Udvar-Hazy Center, part of the Smithsonian's National Air and Space Museum, in northern Virginia. Enterprise, NASA's prototype orbiter, which had been on display at Udvar-Hazy, was moved to the Intrepid Sea, Air and Space Museum in New York City. It was damaged by Hurricane Sandy earlier this week. Endeavour, the youngest of the shuttles, opened on public display at the California Science Center in Los Angeles on Tuesday (Oct. 30). Atlantis' exhibit, when it debuts next year, will showcase the shuttle and its 30-year history. Guests will see Atlantis as it appeared during its 33 spaceflights, its payload bay doors open and (replica) Canadarm robotic arm extended. Surrounding the space shuttle will be more than 60 related artifacts and displays spanning two floors, including a full size model of the Hubble Telescope and the "beanie cap" oxygen vent hood from Launch Pad 39B. NASA is retaining ownership of Atlantis, but the cost of its move and exhibit is being financed without public funds. Delaware North Companies Parks & Resorts, which runs the visitor complex under contract to NASA, is funding the orbiter's display through the revenue generated by visitor admission, food and retail sales at no tax payer expense.